Welcome to NewsDirect411: Senator Dino Melaye Handcuffed On Hospital Bed. 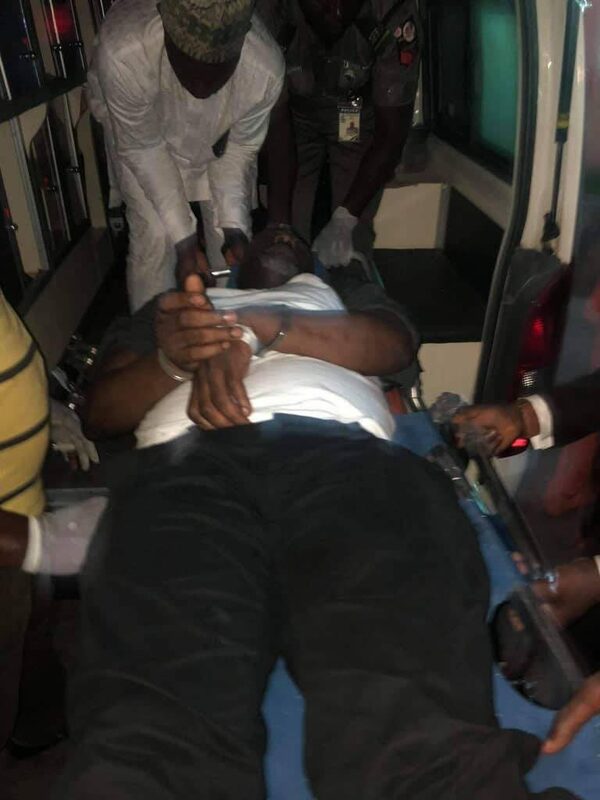 Senator Dino Melaye Handcuffed On Hospital Bed. Visitors have been prevented from seeing the senator who jumped out from a moving police vehicle on Tuesday in a bid to escape. The police re-arrested Melaye at the Zankli Hospital on Tuesday evening and transferred him to the current hospital where he was being dehumanised. The police had in a statement from the Force Headquarters, issued by Jimoh Moshood on Tuesday evening, said at about 12.00hrs of Tuesday, Melaye while in lawful custody of the Nigeria Police Force personnel and being taken for arraignment in Federal High Court Lokoja from Abuja, escaped from lawful custody when hoodlums and miscreants in Two (2) Toyota Hilux Vehicles blocked the Police vehicle conveying him around Area 1 Round About, Abuja. Moshood said in the process, the Senator jumped out of the Police vehicle through the window and was rescued from the Police men by hoodlums and miscreants to an unknown destination. “The Police team re-enforced and trailed Senator Dino Melaye to Zankli Hospital, Abuja where he was re-arrested. The Senator would be arraigned in court without further delay. “Meanwhile, one of the Toyota Hilux vehicles used by the hoodlums and miscreants in aiding the escape of the Senator has been recovered by the Police investigation team. “The Inspector General of Police has therefore directed a thorough investigation into the circumstances leading to the rescue and escape of Senator Dino Melaye from lawful custody,” he said.